March 3 – West Virginia teachers have rejected the tentative agreement proposed by union leaders. 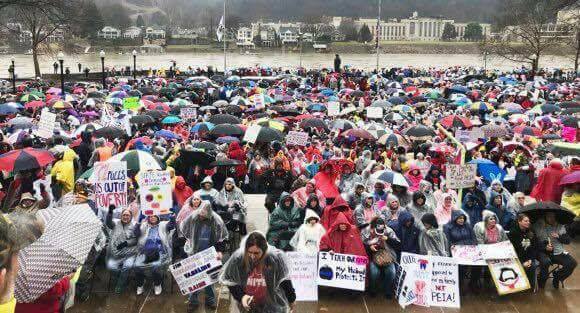 Since we published this article, teachers have begun an occupation of the West Virginia State Capitol, vowing to stay until their demands are fully met. We fully support the teachers and their strike and will be following these events closely including sending people to West Virginia for interviews and building solidarity. February 28 – It has been announced that a tentative settlement has been reached after a heroic four-day strike between the teachers of West Virginia and the state’s governor. Not all the details are clear and it must be approved by the state legislature, but it includes higher wage increases for the drastically underpaid school staff of the state. The teachers’ strike, it must be underlined, was 100% solid across all 55 counties to the end with mass rallies at the state capitol. In addition to low pay, key issues in the strike are health insurance premium hikes and benefit cuts in the Public Employee Insurance Agency (PEIA). This was paired with a budget bill signed on Wednesday by billionaire Republican Governor Jim Justice that offers only a minuscule 2% raise for educators in a state already ranked 48th in average teacher salaries. Teachers argue that the bill fails to compensate for increased PEIA health insurance costs and increased cost of living expenses at a time when the school system is hemorrhaging new teachers to other states with better pay. While Governor Jim Justice has shed crocodile tears for union teachers by saying “I know you’re underpaid, underappreciated,” he has never been an advocate for working people. Justice is a billionaire coal baron whose mining companies have a long history of unpaid taxes and safety violations which earned him the title ”top mine safety delinquent.” A 2016 NPR article revealed that injury rates in Justice’s tax-delinquent mines were twice the national average and safety violations occurred in his mines at more than four times the national rate. In 2016, Justice secured an endorsement from the WVEA on the Democratic Party ticket over his Bernie Sanders-endorsed opponent Jeff Kessler. After winning the election, Justice announced his return to the Republican Party at a Trump rally in 2017 after a series of meetings with the administration on their coal power initiative. Union teachers supported Justice because he promised to improve their conditions but instead he realigned himself with Trump’s Republican Party which has gone on the offensive against working people with their vicious tax plan and attempts to repeal the Affordable Care Act. Since public sector collective bargaining and strikes are illegal under state law in West Virginia, attorney general Patrick Morrisey has threatened striking teachers with an injunction to force them back to work. At this point the teachers are undeterred by the attorney general’s threat. The most important factor in the current fight which can stay the hand of the state is the massive solidarity and support shown by the public and other unionized workers. The attempt to stop collective working-class action through intimidation runs parallel to a Texas superintendent’s threat to suspend any students who walk out to protest gun violence following the Valentine’s Day shooting in Parkland, Florida. It also echoes the anti-protest and anti-free-speech legislation that has bloomed like toxic mold across nearly 20 states in the U.S. following the 2016 election. These attempts to silence political speech add significant weight to the upcoming Janus v. AFSCME Supreme Court decision, which callously attempts to paint fair share union dues as a violation of the first amendment, and is a serious threat to public sector unions nationwide. There’s a long history of militant labor struggles in West Virginia. Some happened in living memory, like the nationwide miners strikes in the 1970s that paralyzed the powerful mining corporations. Others date back even to the tumultuous events of the 1930s and even earlier to pivotal moments in the development of unions in the U.S., like the Battle of Blair Mountain. This history has left strong traditions of solidarity that are crucial to winning the strike at hand. Other unions, parents, and students have organized their own actions to support the teachers. This pressure has even forced some school boards and superintendents to voice support for the “illegal” strike! Working people in the U.S. are struggling with low wages, parasitic medical insurance programs, and the suppression of collective action to fight for better conditions. But when we working people are organized, use our collective power, and have the courage and the will to stand together despite attempts to intimidate and silence us, we can win real victories against the capitalist system that exploits and oppresses us. The determination and militancy of striking teachers in West Virginia and the student walkouts throughout the country in response to the mass shooting epidemic are giving confidence to millions of working people to fight for better conditions and a better world. Socialist Alternative stands in solidarity with striking teachers in West Virginia who have taken their place in history alongside all the brave unionists throughout American history who refused to back down when the bosses and politicians threatened them and stood in the way of a better life.